My wife is from east Texas. She grew up in Longview, TX but her parents now live in Tyler, TX (seems spooky that she married a Tyler) so we visit from time to time. On consistent time we see them is on the 4th of July to celebrate Independence Day. We spent a bit more time in Tyler than we usually do, which gave me the opportunity to sample some of east Texas’ finest BBQ (according to Texas Monthly’s list). Having sampled the best BBQ in my area fairly recently, I was excited to sample something fairly close to it. 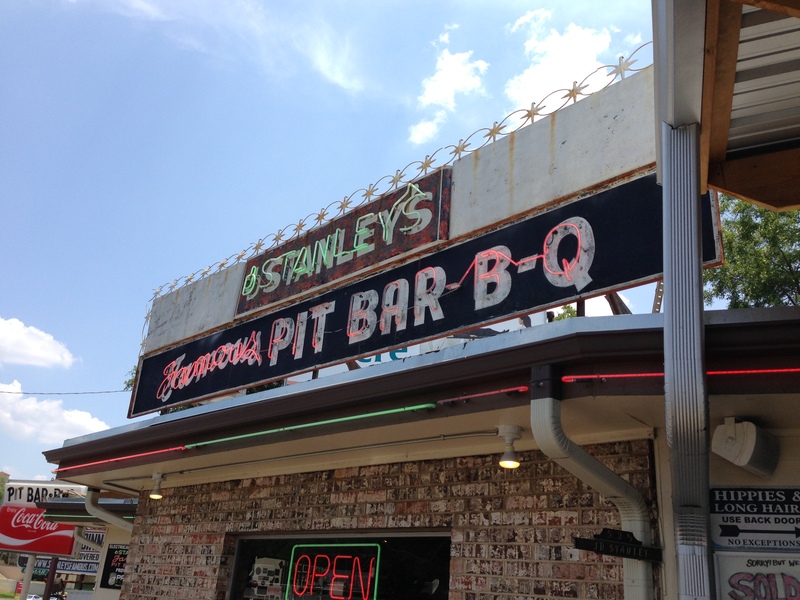 When I asked Haley’s father (who has competed in BBQ competitions before) where he would go for great food, he never really mentioned Stanley’s as being at the top of the list. My wife, baby and I went to Stanley’s on a Friday during lunch and initially were worried because the parking was very spotty. We found some parking behind the main dining area and walked down the metal steps to the bar and live music stage. No one was playing this particular Friday morning, but we both decided it would be a great place to watch live music…without a baby in tow. My wife saved a table for our group that had a great view of Beckham St. and I went into the smallish indoor seating area to order. My wife got a sliced brisket sandwich while I chose the two meat plate with sliced brisket and turkey. Most traditional BBQ people will go with ribs and brisket, but I love the flavor of great smoked turkey and if it’s done right is fantastic. One thing I noticed about the menu was they gave you a guide to ordering brisket, prompting you to tell the person taking your order if you’d like fatty or more bark. I didn’t specify to see what they would give me. The wait for food wasn’t bad even though we showed up in the middle of a minor lunch rush. The portions could have been a little bigger, although if I wanted a ton of food I could have ordered the meat of my choice by the pound. My wife’s sandwich seemed to be very lean brisket, which she enjoyed, while my brisket came with a great bark and smoke ring. There wasn’t a ton of fat on the brisket, but there was plenty for the portion I was given. It tasted wonderful and I consumed it without any of the sauce that was placed on our outdoor table. The turkey was smokey and peppery, exactly how I like a smoked turkey. The side items that came with my plate were pretty good, but I wasn’t there for beans and cole slaw. The friends we were there with sampled some ribs as well as brisket and their opinion was that the pork ribs weren’t as meaty as they could have been, but maybe they were from the end of the rack. All things considered, we really enjoyed our trip to Stanley’s and will definitely be back in future trips to Tyler, TX. I would love to go check out some live music on their outdoor patio or see what their breakfast menu looks like. Next time I’m going to branch out and try out some different things to see the scope of their products.